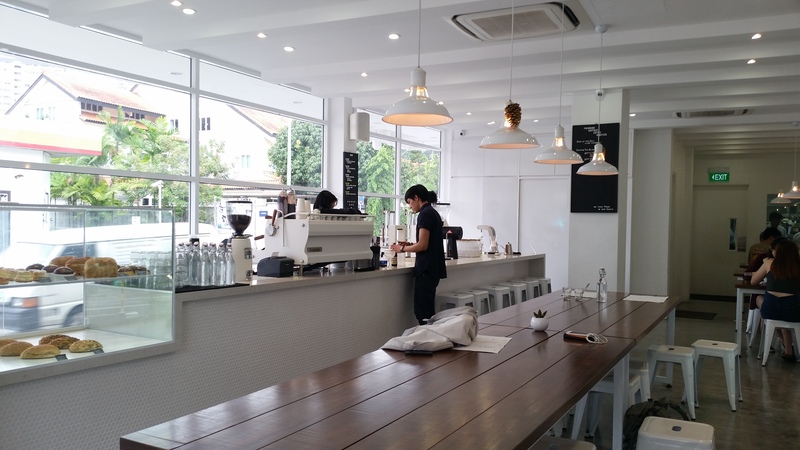 the newest kid on the upper thomson cafe block is pacamara boutique coffee roasters – a joint which recently relocated from somewhere in the vicinity and renamed and revamped itself along with its location change. i never visited them previously but from what i’ve read online, it used to be oz speciality coffee at thomson v two. 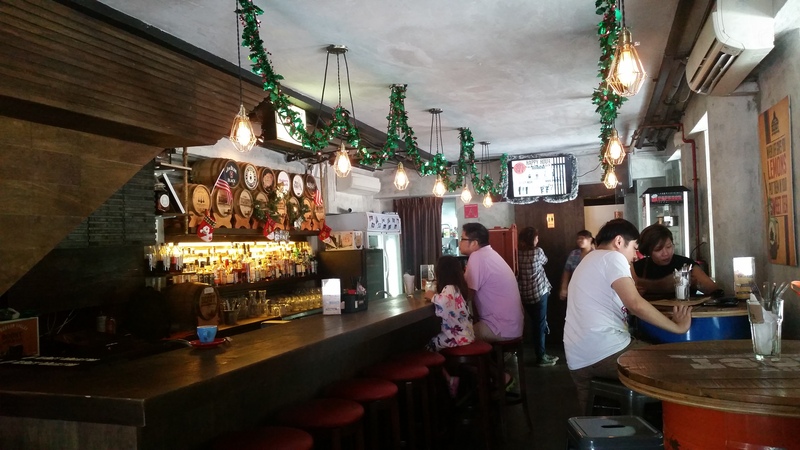 pacamara occupies a spacious corner unit at the row of shops right after the now-defunct longhouse food centre ( 😦 oh how i miss my prawn mee, duck rice and goreng pisang 😦 #jcmemories) along upper thomson road. it has huge glass windows that let in plenty of natural light, giving the cafe a very uplifting vibe (but also as my mother would say, potentially resulting in pigmentation if you plan to sit there the entire afternoon lol) and providing the perfect set-up for the perfect instagram picture (not to mention the adorable little pots of succulents on the tables that serve as good props to fill awkward gaps – hello good photos!). clean lines, a largely white colour palette and simple wooden furniture make for a simple and fuss-free but stylish minimalist space. 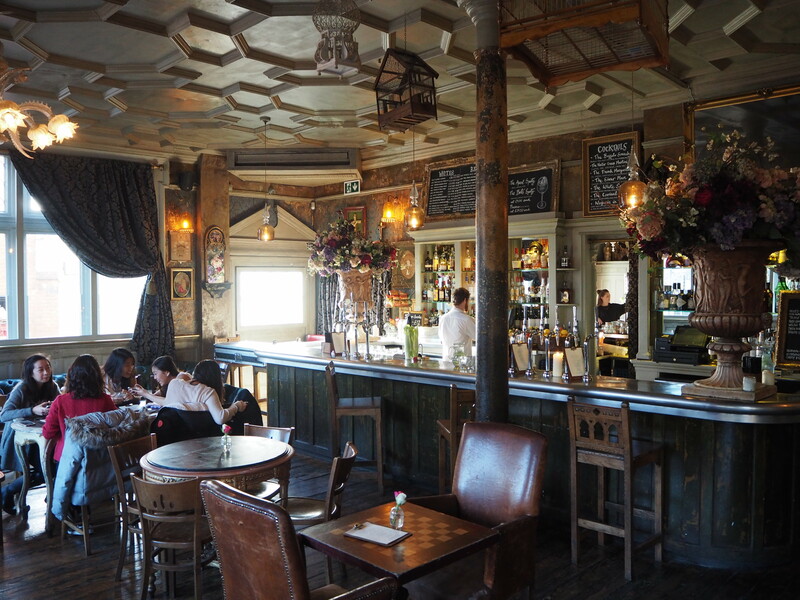 as you can see from the picture, tables are communal so this might not be the best spot for a cosy and romantic first date or an intense pour-your-heart-out conversation with the bffl, but it is great for all other purposes, especially those of the chill hangout sort. 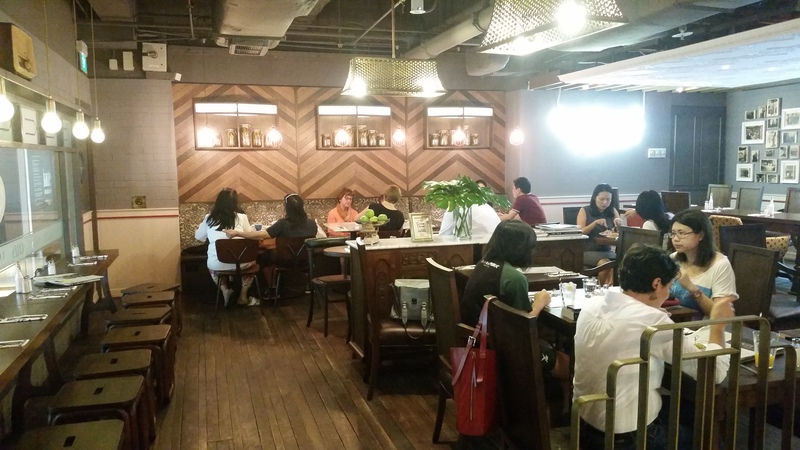 this picture was taken at 1030am when we first arrived – the cafe was rather empty and we were clearly spoilt for choice as to where to sit; by the time noon came around however, it was full and buzzing with a healthy lunch crowd. 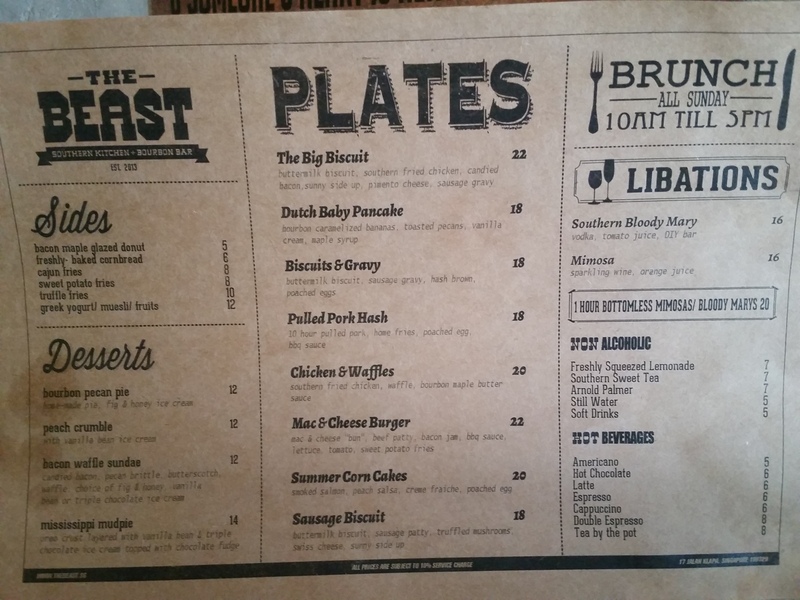 we were there for brunch and i was rather pleased with the good mix of sweet and savoury offerings they had despite there not being that many things on the menu. eventually decided to order a truffle benedict and french toast to share between the 2 of us. 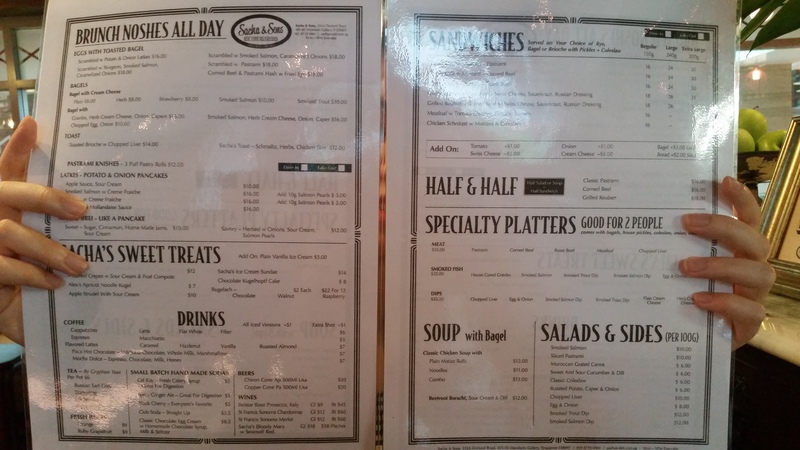 orders are placed and payment is made at the counter, followed by the food being served to you when ready. our noses were excited by the tantalising whiff of truffles as the dish was served to our table. i’ve read other reviews where people complained that there was barely any hint of truffle in this dish and although i agree that it wasn’t particularly strong, it was definitely there (perhaps there is some inconsistency in the amount added? or they’ve improved since the reviews i read were written?) and we definitely smelt it! needless to say, the eggs were poached perfectly, all oozy and runny and pregnant with liquid gold. the ham was of good quality, smoked well and sliced relatively thickly. as for the spinach, it was lightly-seasoned and cooked to just the right point – soft but not overdone such that it became mushy or overly wet. the hollandaise sauce brought everything together wonderfully and the truffle complemented it very well, adding that extra oomph to it that allowed it to remain light despite its creaminess. as for the brioche, it was buttery, fluffy and soft but crusty at its edges from a light toasting. 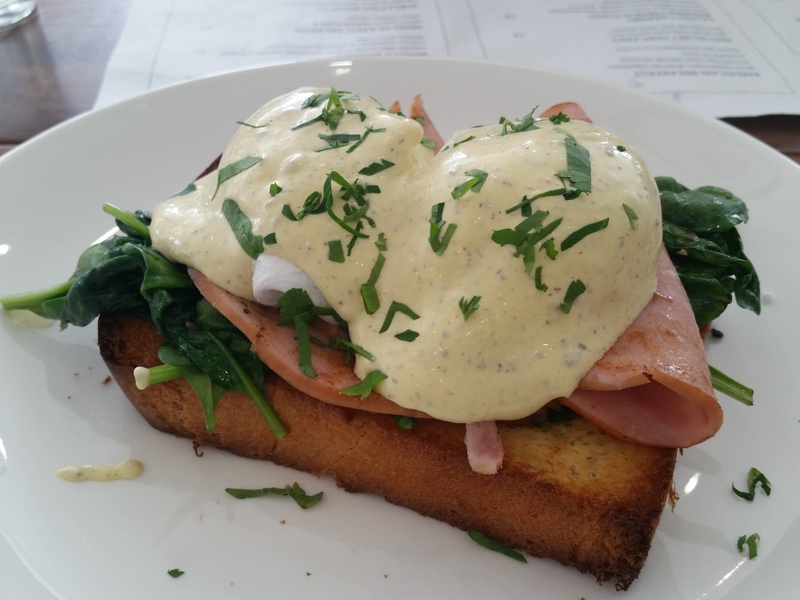 i thought this was a very good rendition of the brunch essential eggs benny. 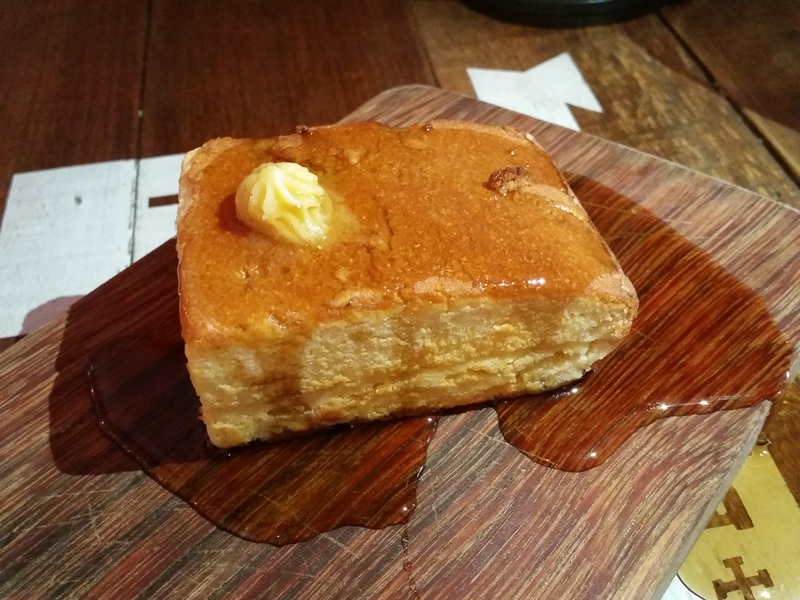 the french toast looked great and luckily we were not disappointed with how it tasted at all! i look forward to having this again just looking at the picture above and recalling how it tastes – i remember the thick salted caramel sauce that reminded me of hot fudge on a sundae, the generously-added and lovely slices of lightly caramelised bananas and the perfectly soft/eggy/fluffy/warm slices of thick brioche toast. it was surprisingly not too sweet, and the granola bits were a nice touch – they added additional texture and a nice crunch to the dish. as for the whipped cream, i don’t think we touched it at all because the toast by itself was so enjoyable! needless to say, we left belly happy and very happy; it was a suitably satisfying last brunch of the year 2014 (food-wise and company-wise) 🙂 indeed, not only is pacamara’s food good, the environment is nice, parking is free (if you’re lucky enough to get a space in the parallel parking lots that line the row of shopfronts), coffee is great (apparently, will definitely try next time! ), and prices are nett. 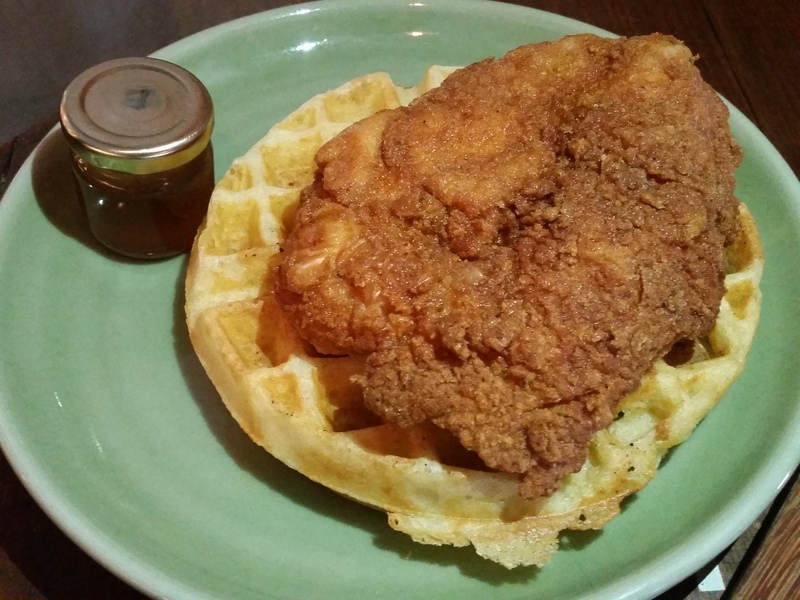 i’d certainly recommend this as somewhere to add to your cafe-hopping list! happy new year everyone!!! you may or may not have noticed that we now officially have our own domain (ie we’ve dropped the wordpress from our url), hurrah! it was one of nic’s new years resolutions to get over his self-proclaimed tech noobness and sort that out, and he very adeptly did so thank you nic (you are now forgiven for leaving me to do most of the writing 😛 )! 😉 i am ashamed to admit that i haven’t been religiously updating about the new places back home that i’ve managed to check out this holiday, but today i woke up and decided i had better get cracking on that given that there are a mere 2 days left to christmas break, so here i am, appropriately kickstarting the new year with a post on the newly-opened sacha & sons. while in nyc over summer, i had the honour of having what was probably the best (and also most expensive) bagel in my life thus far – a classic smoked salmon cream cheese bagel from traditional new york deli russ & daughters. 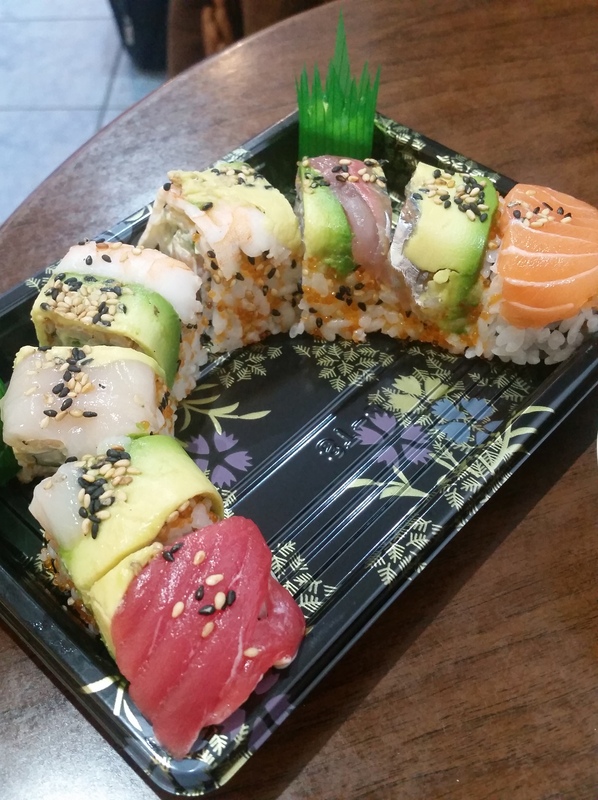 i occasionally think of it and wonder when i will get to taste a bagel that comes close again, and am delighted to say that judging by the food i had in this little corner of mandarin gallery that day, i think i might have found just the place! 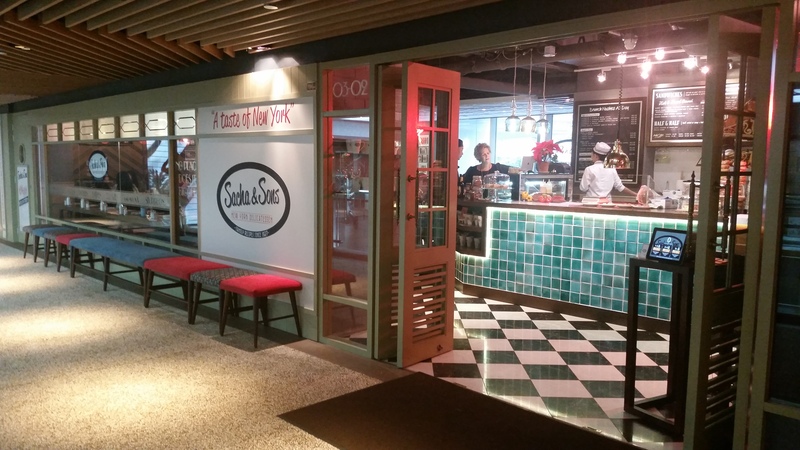 located right next to its sister restaurant wild honey (the two are owned by the same couple) in a corner of mandarin gallery’s third floor, this delightful delicatessen occupies a bright, tastefully-decorated and spacious unit that is perfect for a casual hangout over some unique nosh. their pastrami came highly recommended and i really wanted to try their bagels, so ordering was a surprisingly stress-free affair despite the myriad of choices available on the menu. we decided on a grilled reuben with pastrami and scrambled eggs with sturgeon and smoked salmon, placed our orders and paid at the counter, and returned to our table to eagerly await the arrival of the food. 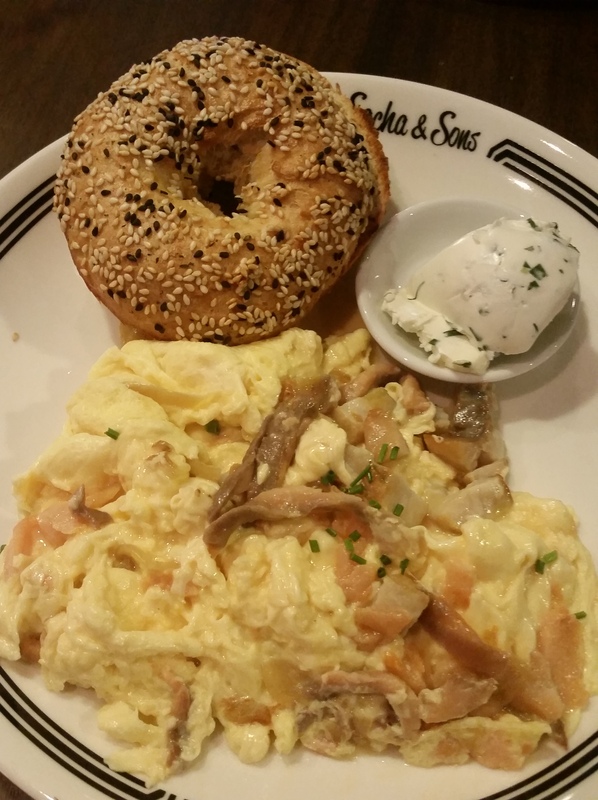 i am a huge fan of bagels and this was without a doubt one of the best bagels i’ve had in singapore. hand-rolled, it was served freshly-toasted and warm with a crisp exterior encasing a soft and fluffy (while retaining just the right amount of bite) interior, basically the perfect texture of a quality bagel. i am also a huge fan of seeds and nuts (who isn’t?) so the generous sprinkling of sesame seeds that topped the bagel was truly my cup of tea and added additional texture and crunch to the bread. a generous slathering of some thick and creamy cream cheese and a heap of scrambled eggs to top it all off made for the perfect combination of flavours. the addition of herbs in just the right amount to the cream cheese also lifted its taste and prevented it from getting too heavy. as for the scrambled eggs, they were well-executed – fluffy, smooth and neither too dry nor too wet. very well-sized slivers of fish were generously added to the mix (every spoonful of eggs contained a decent dose of fish pieces) and gave the eggs texture and a savouriness, while the caramelised onions added sweetness. i feel like the latter was overpowered by the strong flavours of the fish though. 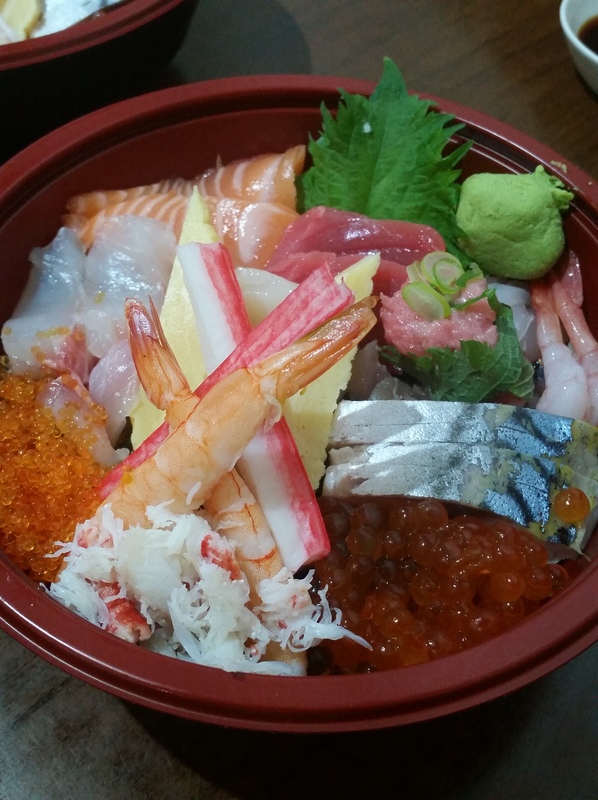 and i think i’ll probably opt for the purely salmon and onion and sturgeon-free option the next time i order this – if you aren’t a fan of strong fishy flavours, you might want to do the same because i felt that the sturgeon added quite a distinct fishiness. 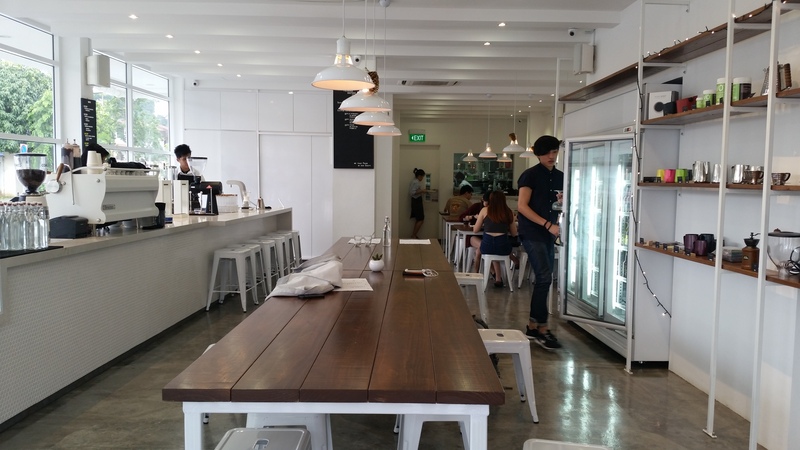 the only other place in singapore where i’ve had a grilled reuben is nassim hill bakery. it might be a case of personal preference, but my friend and i both agreed that sacha and sons’ rendition is far better. we were so impressed and satisfied by this humble-looking sandwich that there were already discussions of returning for more as we savoured our respective halves. the pastrami is house-cured and smoked, and is so fragrant and perfectly-flavoured that my mouth waters thinking of sinking my teeth into it again. 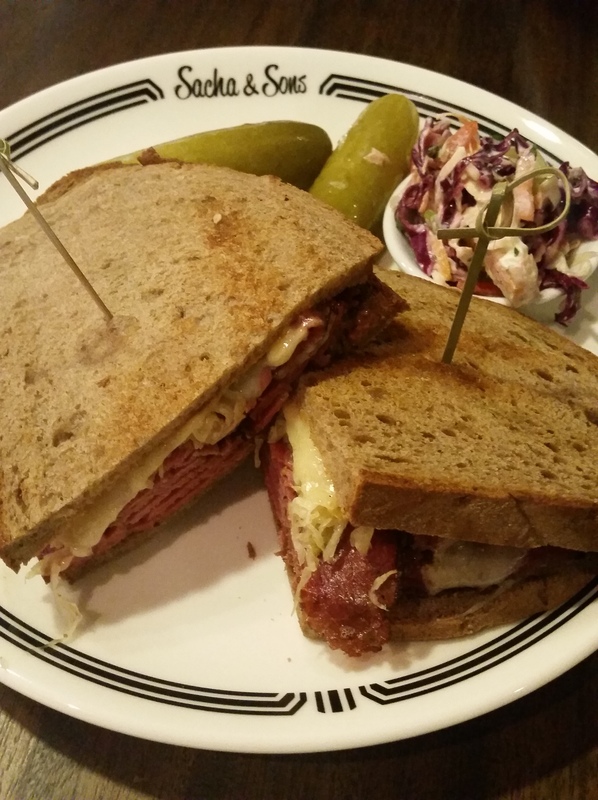 for the grilled reuben, they have achieved the perfect ratio of meat to cheese to sauerkraut, resulting in satisfaction guaranteed in every bite. i was initially worried that it would be a tad dry, but my worries were unfounded because everything sandwiched in between the two slices of delicious toasted rye bread came together amazingly well and there was an immensely satisfying burst of flavour in each mouthful. the pastrami was tender and so flavourful, oh and did i mention its beautiful pink hue? what stands out about this sandwich for me is that despite being so tasty and sounding so heavy, it remains light and i believe i’d have no problems finishing an entire one. perhaps it is because the flavour of the pastrami is delicately fragrant, the cheese is added in just the right amount to complement and not overpower the other components, and the sauerkraut brings a lovely and refreshing slight zest and tang to the mix. they are also generous in providing two whole pickles along with the sandwich. i am seriously looking forward to returning for this when i’m next back in singapore. i was very impressed with the entire set-up and will certainly return. hopefully they maintain both the high standards of food and service even as they grow in popularity (which i am sure they will). another plus point is that they take reservations, yay! definitely go check it out! 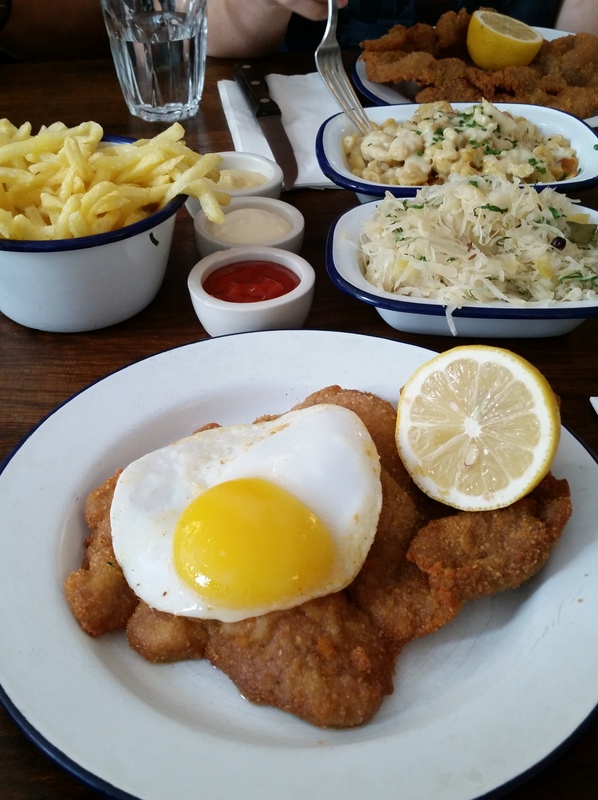 pictures of boopshi’s succulent schnitzels accompanied by good reviews were popping up too frequently to ignore on various social media platforms throughout last term and so sometime in the middle of it, i decided that a meal there was most definitely in order. 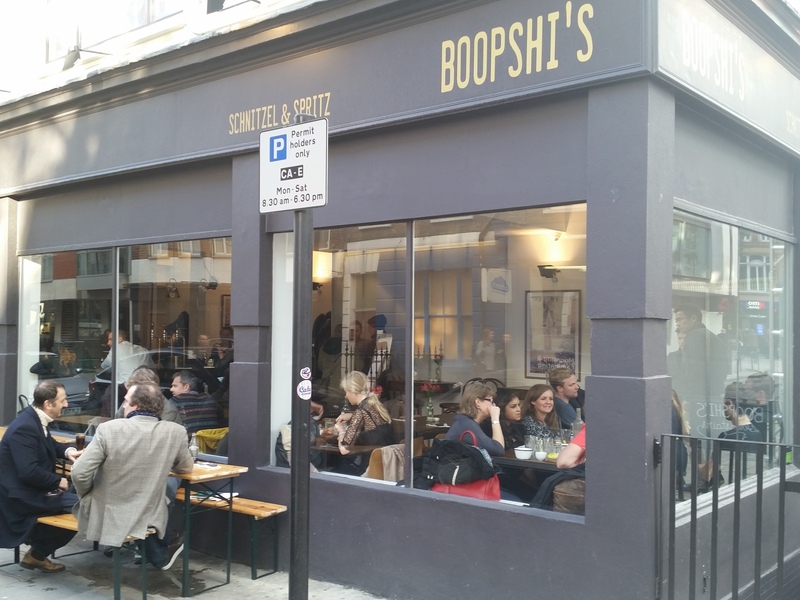 specialising in austrian schnitzel and spritz, boopshi’s is a relatively new addition to the buzzing fitzrovia restaurant scene. with large glass windows letting plenty of natural light in and simple wooden furniture, this corner shop is simple and nothing fancy at all, but certainly a great space for a casual meal. we had an early lunch on a friday afternoon and the place was empty when we first arrived at about 1230, but soon filled up with the lunch crowd. 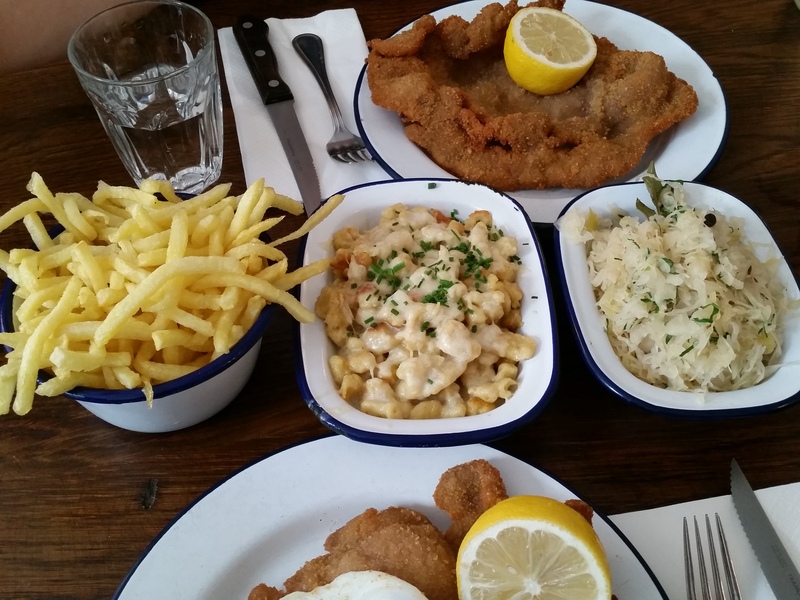 five pairs of eyes sparkled as our schnitzels were placed before us – to hungry souls, there are few things better than being presented with huge slabs of delicious breadcrumbed and freshly-fried goodies! what you see in the picture above doesn’t do justice to the generous serving sizes, for some reason my schnitzel was a little smaller than the rest… one of my friends was served a pork schnitzel so big that the plate beneath was nowhere to be seen, i kid you not. i’m glad the gravy took a while to get to the table because it allowed me to try some of the schnitzel as it was, and to fully appreciate the fine breading and naturally sweet pork. the juicy and tender meat was moist and coated in just the right amount of breadcrumbs such that the dish remained light despite it being so meaty. i also liked the fact that it was not drenched in excessive amounts of oil and i didn’t feel like i was eating anything that was exceptionally greasy (wishful thinking? denial?). the lemon definitely helped; a healthy dose of some lemon juice added a lovely refreshing zest and helped to lift the taste of the schnitzel. taken with the gravy that was very tasty, this was a suitably hearty and satisfying treat. 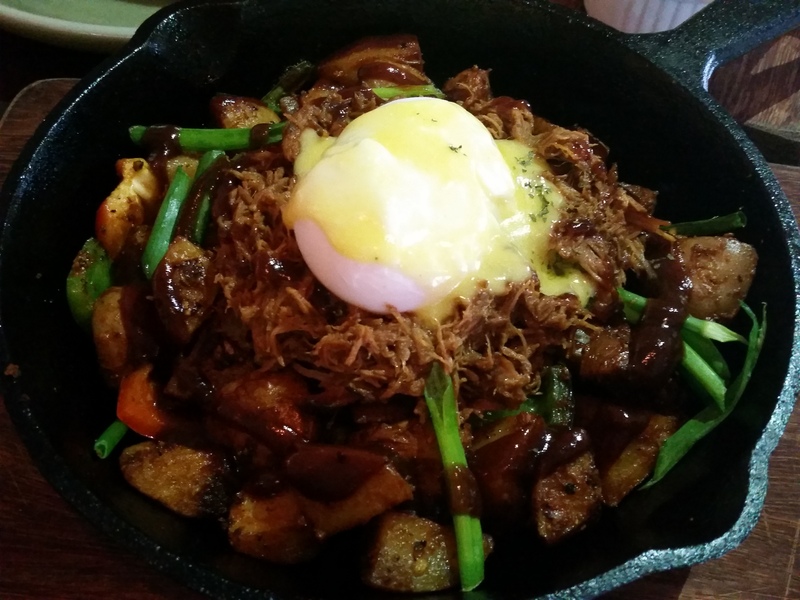 as for the duck egg, it was an egg lover’s dream come true. cooked to absolute sunny side up perfection, the egg was slightly browned on its underside and had a yolk so large that it was enough to slather all over the schnitzel upon the all-important popping of yolk, and so creamy that it left me craving duck eggs for a few days after (subsequently scored half a dozen from fortnum & mason and was super eggcited). they did not disappoint and were a great accompaniment to the main event. starting with the fries, they were thin-cut shoestring-types which though appeared a little undercooked for fries because of their very yellow hue, were actually cooked very well! crisp on the outside and warm and soft on the inside. as for the spatzle n cheese, it was essentially austria’s take on mac and cheese – firm and chewy pasta (texture reminded me of gnocchi) generously enveloped in creamy but light cheese. i thought it could have been a little more flavourful but all was good otherwise; it was like a warm homecooked hug 🙂 last but not least, the sauerkraut was probably my favourite side. it was a great rendition of this traditional dish, wonderfully seasoned and cooked just as sauerkraut should be, soft but still retaining a slight crunch. i could have had a whole serving of this to myself! given the apple strudels i’m accustomed to (think ritz apple strudel – super flaky, crisp pastry and chunky apple slices), this was not quite what i expected. i loved the apple filling which consisted of plump raising and thin, moist and juicy slices of apples which were heavily spiced with cinnamon (one of my friends actually found it too cinnamon-y), but was not a huge fan of the pastry that encased it. although it was light and thin, i would have preferred it to be flakier, airier and crispier; here it almost seemed dense because the many layers were stuck together. the fragrant vanilla ice cream brought everything together rather nicely and was a good complement to the very cinnamon-y apple filling. 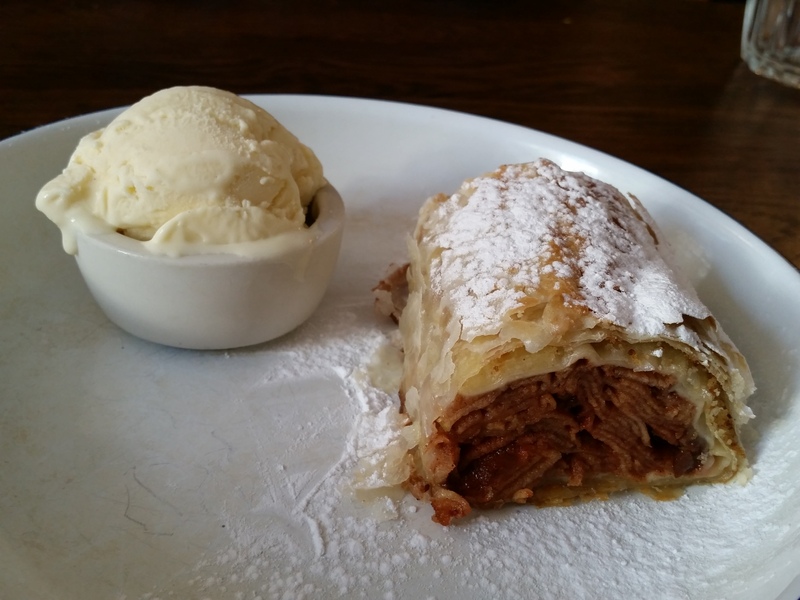 perhaps it is a matter of personal preference of how one likes their apple strudels to be (catering to commercialised tastebuds vs very traditional as boopshi’s does it), but i was a little disappointed because this came highly recommended as one of their specialties. would probably skip dessert and focus on the mains when i next return! oh and on the topic of desserts, i was also disappointed that the waitress seemed completely unfamiliar with the menu and didn’t know any better than us what a “kaiserschmarrn” was; she had to check with the other restaurant staff. 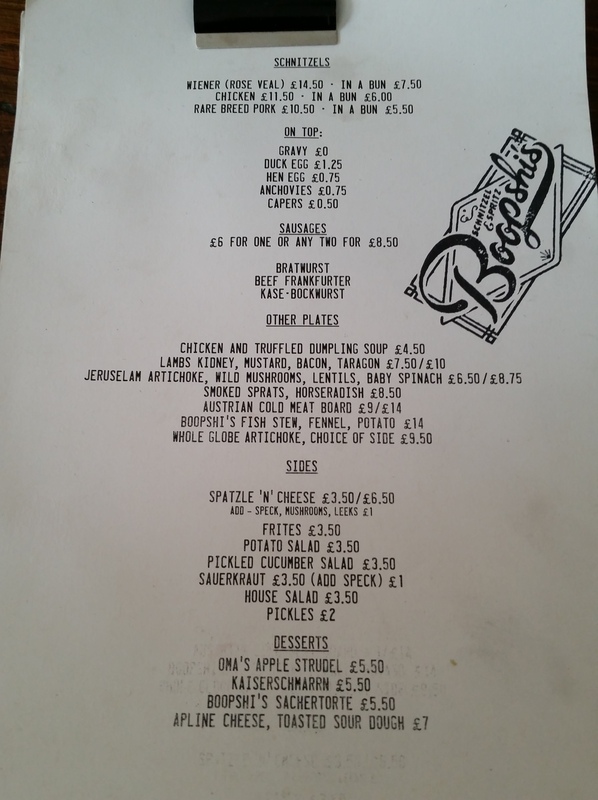 neverthelesss, boopshi’s is a great spot for a hearty meal that adds to the wonderful mix of dining options along charlotte street. definitely worth a try if you’re up for some schnitzel! this little street stall has been parked by this pavement for more than 30 years. 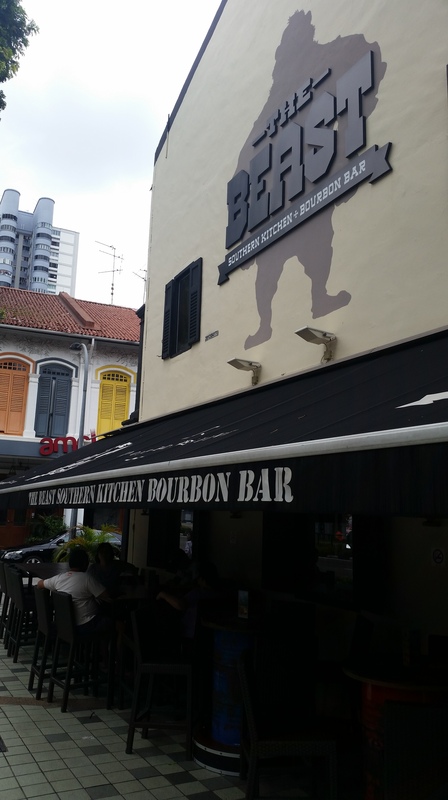 recent threats of closure caused uproar among loyal fans and despite now being forced to have no fridge or supplies stored on site, they have managed to keep open, albeit with greatly reduced opening hours. thank goodness they’ve managed this feat, because it has kept many a tummy very very happy, including harry styles’. yes. 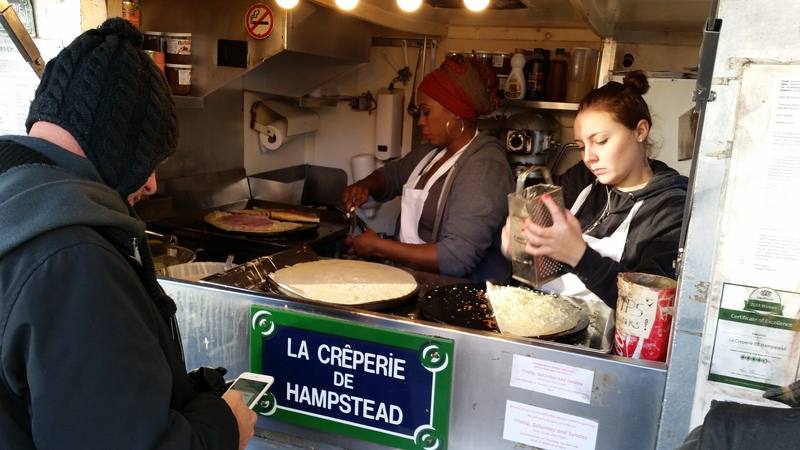 i kid you not – all 1D fans out there please listen up: harry styles has been spotted in the queue for crepes! okay the savoury crepe was delicious, but this, THIS is what i crave and am already dreaming of going back for. doesn’t look too great, but tastes out of this world. the combination of banana, coconut, dark chocolate and rum was magic in my mouth!!! 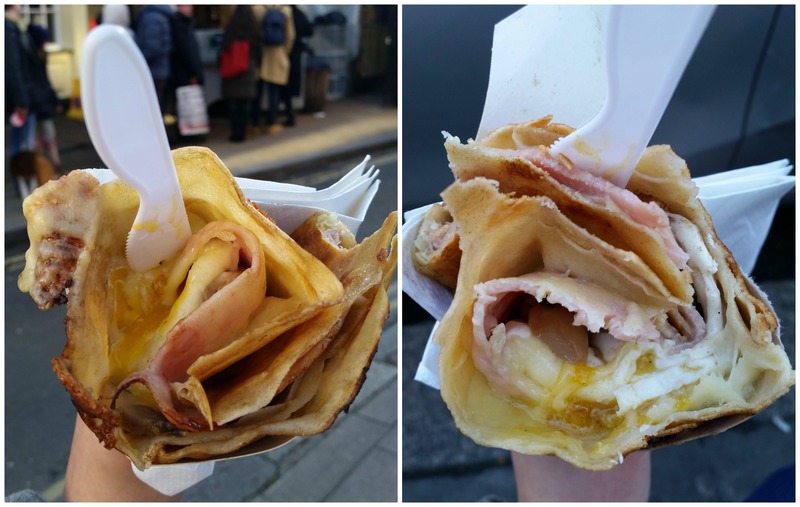 i thought the crepe itself for this sweet crepe could have been a tad crispier (note how the savoury crepe is more brown) but the slight savouriness of the batter created a perfect sweet-salty combination with the sweet toppings. 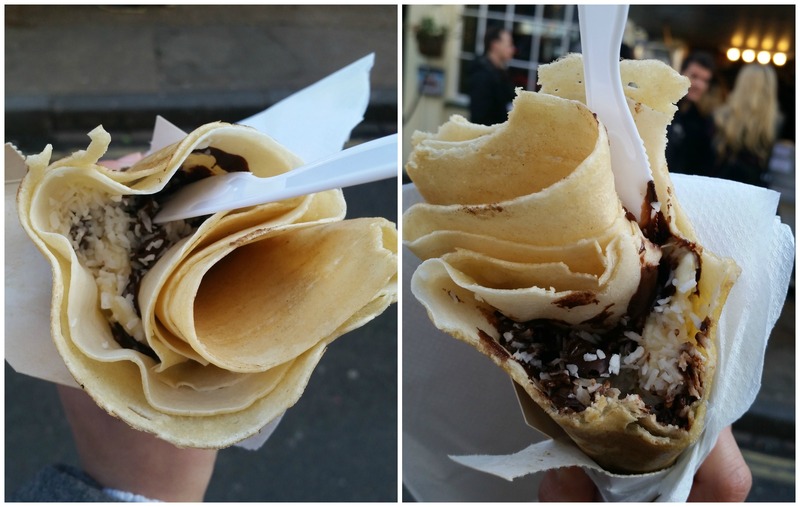 the high quality of the dark belgian chocolate shone through thanks to their generous addition of it (tendency to go everywhere if crepe is not eaten strategically), and went wonderfully with the dark chocolate and banana. the taste of rum was strong, and my friend did mention she would probably ask for a slight reduction in it the next time because she found it a little overpowering. i on the other hand, thought perfect proportions were achieved. already dreaming of going back to get some of this stuff back in ma belly after christmas break!!! 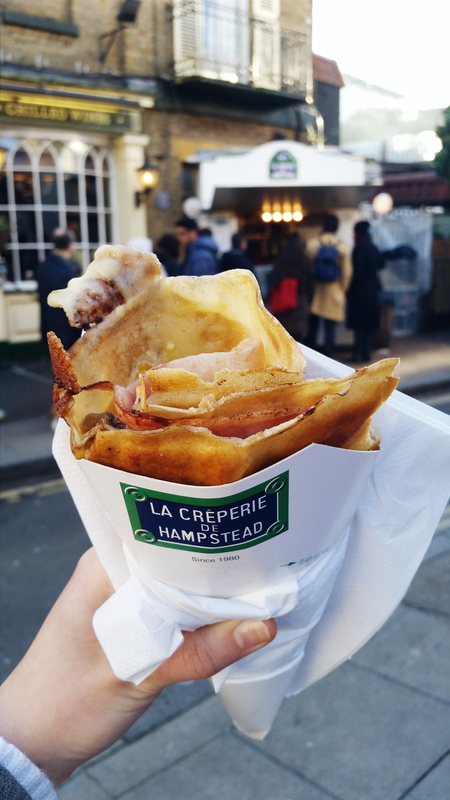 it was my last day in london of 2014, and it was perfectly spent finally having the best crepes in london ❤ i foresee pilgrimages to hampstead becoming a frequent affair next term (last official school term in ldn) – before i even made it 50m away from the stall as we left, i was texting various friends very excitedly telling them that i’d have to take them for crepes next term… best crepes in london? oh #YAS. 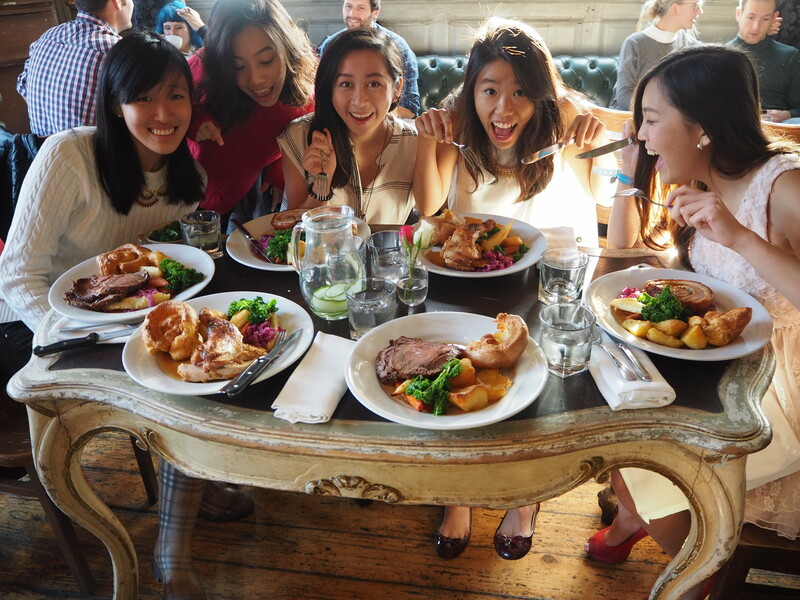 sunday roast is always a good idea, and birthday sunday roast for the last to turn 21 in our house was one of our best ideas yet. the birthday girl actually wanted to have her birthday party at paradise (it was fairytale-themed so it would have been 200% appropriate), but the room size wasn’t suitable for the number of guests so she had to pass… it just made her even happier when we removed her blindfold upon reaching paradise and she realised where she was though! 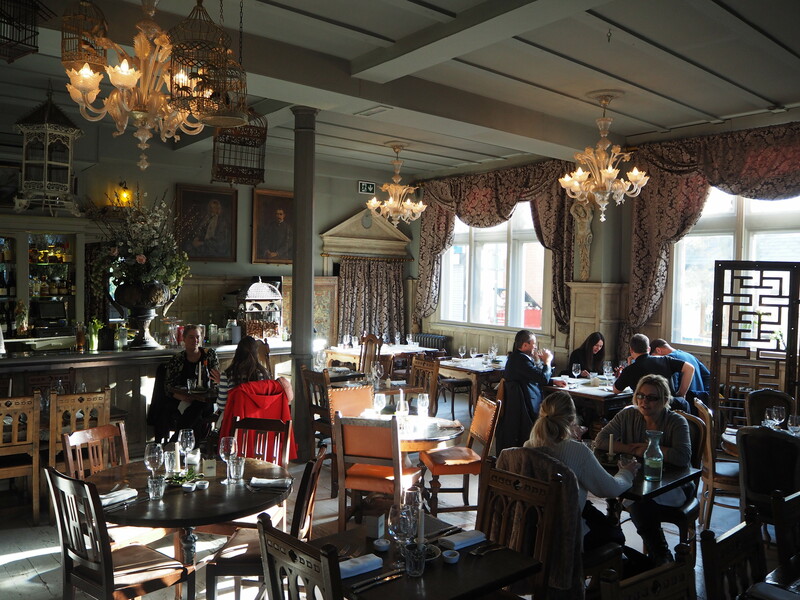 we were seated here in the bar area because the dining room was fully booked, and found that our initial worries that it would be lacking in the atmosphere that the main dining area had were completely unfounded. 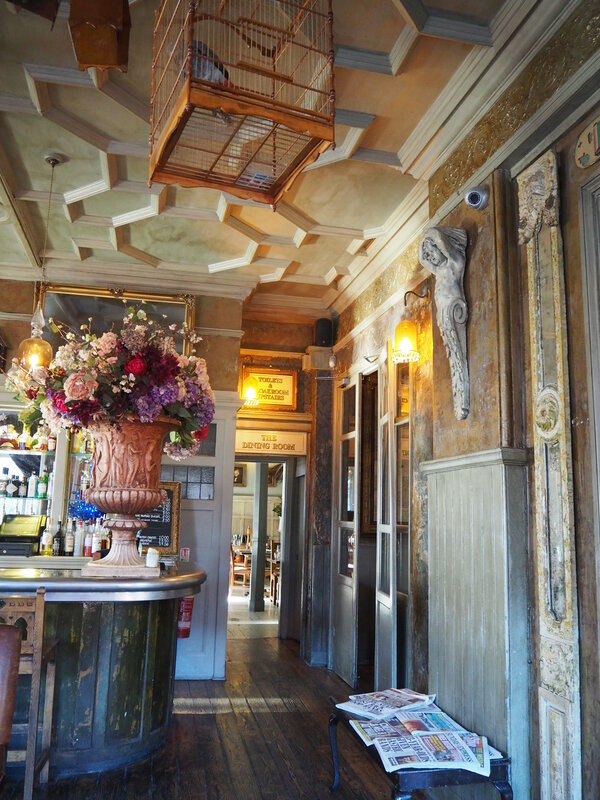 with huge flower vases, an interesting mix of furniture and one of the prettiest bar counters i’ve seen, it was perfect for our casual sunday girls lunch. we opted for a mix of roasts from the menu and after quite a wait (we were less than impressed with the service; more on that later), were presented with huge plates of gloriously hearty fare. the other roasts at the table were the herb crust roast chicken (£14.50) and pork belly with bramley apple puree (£15.50). all the servings were extremely generous and just as delicious – the chicken was roasted to perfection, juicy and moist meat encased by a light crispy skin, while the pork belly was tender and not too fatty with an ultra crispy skin. needless to say, we were all belly happy after (nearly) wiping our plates clean. my favourites were the lemon tart and the sticky toffee pudding. the lemon tart was a refreshing end to the meal as it always is, the lemon filling tangy but not too sour and of a great consistency. the tart base was crisp and light, and the almonds were a nice addition of texture. as for the sticky toffee pudding, it was dense but not too heavy, and the toffee flavour though strong was not cloyingly sweet or overpowering in any way. the baileys cake had an interesting texture that was a cross between a light cheesecake and a cream cake, but reminded me more of the latter. it was very light and its base was very enjoyable though i would have preferred it to be crunchier – instead of the typical kind of base usually made of digestive biscuits, the biscuits used here were lighter and had a subtle chocolatey hint to them. 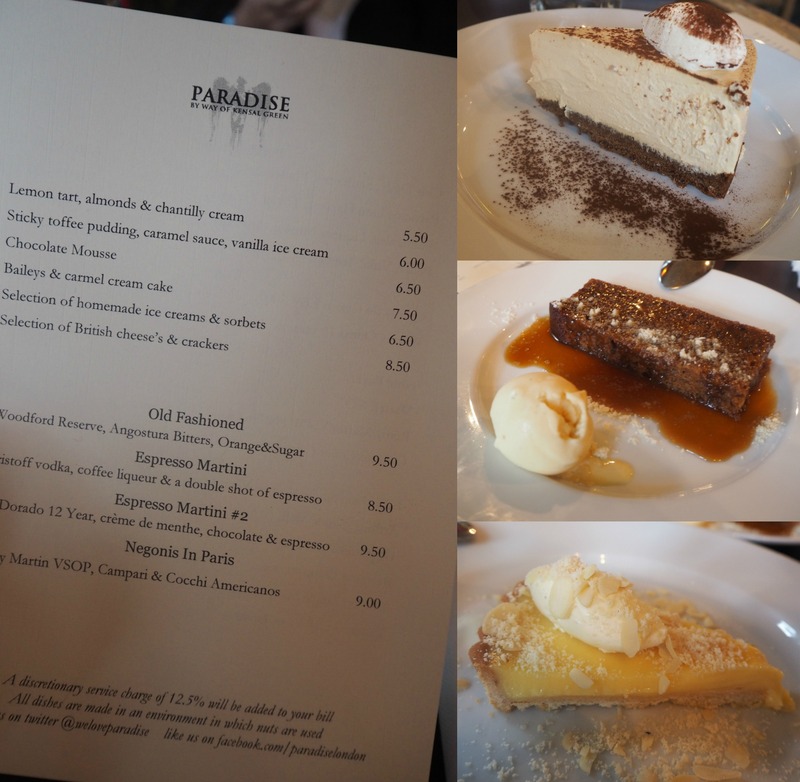 all in all, we were extremely satisfied with our meal at paradise. 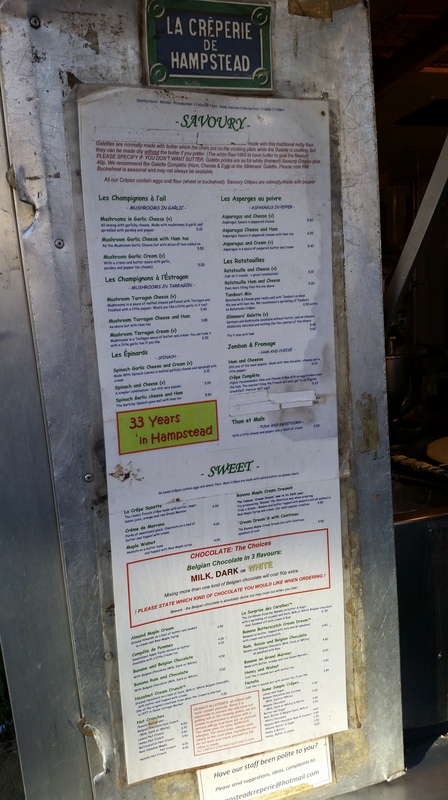 the food was great and luckily it was, because the service was rather frustrating at times. don’t get me wrong – the staff were all friendly, accommodating and lovely, but it was the pace of service that left much to be desired. we had a lot of trouble getting the attention of the staff, and whenever we asked for something, it often took several reminders before our requests (which were simple ones for things like sauce, the bill, water refills etc) were acceded to. perhaps it was because it was a busy sunday afternoon for them, but given the popularity of their sunday roast, one would imagine they’d be used to and good at dealing with such crowds. 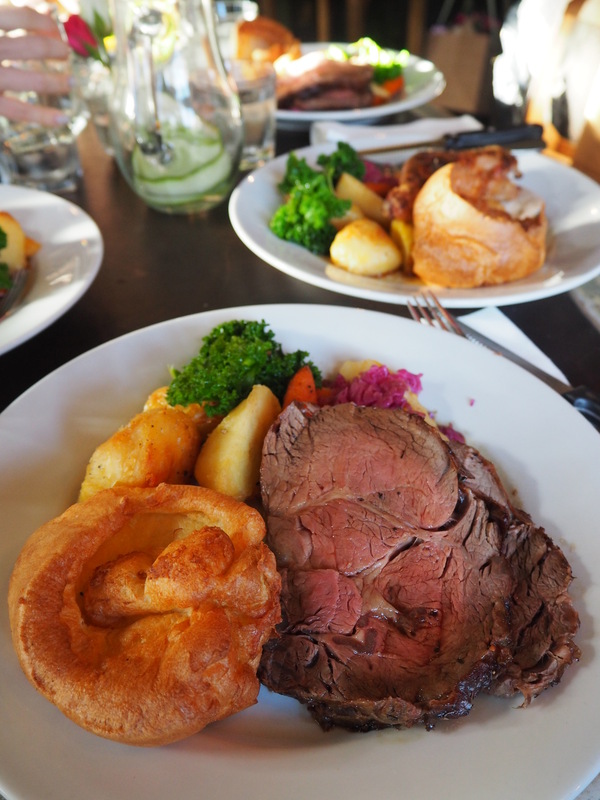 nevertheless, i would still recommend this beautiful place for a wonderful sunday roast experience and hopefully we have better luck with the service next time!